Our accessible Beautiful Hawaii Tour is must do photography activity on Hawaii’s Windward coast! Perfect for anyone who prefers a later start to the day, shorter walks, as well as lovers of nature. A 5.5-hour circuit takes you on a journey to bask in the glory of natural attractions, historical sights, and photo-worthy attractions offered by “the gathering place,” our home and island, Oahu! Start the tour with the panoramic views of the Waikiki and Honolulu Skyline at the lesser known Tantalus Lookout. Next, a dose of history meets you at the Pali Lookout, where King Kamehameha united Oahu under his rule during an epic battle. Then, come face to face with the Ko’olau mountains. Followed by the white sands of Waimanalo. Local food fills the belly before you’re left breathless from the views of Makapu’u Beach Lookout and Hanauma Bay. Bring your camera and snap everlasting photos as you create new memories of a lifetime! Oahu Photography Tours offer a “Beautiful Hawaii” 6-hour photo tour, an accessible Hawaii tour option for individuals who prefer a later start in the day, shorter walks, and the opportunity to photograph majestic locations around our beautiful island of Oahu. This tour focuses on paying homage to the stunning blue ocean waters and expansive skies of “the gathering place,” our island home, Oahu! At our first stop, we will go over your camera and make sure you are ready to capture the panoramic views from the lesser traveled Tantalus Lookout. Letting the mountain breeze and fresh air cool you off in the heat of the day, you’ll see from Diamond Head to Pearl Harbor from this great perch, and you might be able to spot out your hotel from up there! Pali Lookout is next on the itinerary, which offers panoramic views of the sheer Ko’olau cliffs and lush windward coast. Fun fact: The name “Pali” means ‘cliff’ in Hawaiian! Wait to until you see the height of this cliff! The Pali Lookout is also a site of profound historical significance. This lookout is where King Kamehameha successfully conquered Oahu under his rule, after winning the Battle of Nuuanu in 1795. While you photograph the sites, your guide will share the history of this location. Be sure to ask your guide about the painting by Herb Kane that depicts the intense battle of Nuuanu. Now we pass through the Pali tunnels to the Windward side of Oahu where you will photograph the Ko’olau Mountains. You will understand why this mountain range is a Natural National Monument in the United States when you are face to face to this range. If you look close, you might see the white cattle Egret flying overhead, resembling a Jurassic Park scene. Before lunch, we walk along Oahu Island’s longest uninterrupted white-sand beach at Waimanalo Bay Beach Park. Lined with old growth Australian ironwood trees, you’ll adore the atmosphere made delicious by the elements of earth, sky, and water blending in a single photograph. This beach is one of the top stops with Oahu Photography Tours! You’ll never want to leave, but we don't want you to miss our lunch stop. Having worked up our appetites, we stop for lunch at Ono Steaks & Shrimp Truck which offers authentic Hawaiian specialties, such as locally caught fish that you can have grilled or in tacos, Kalua pork, and other delicious options. 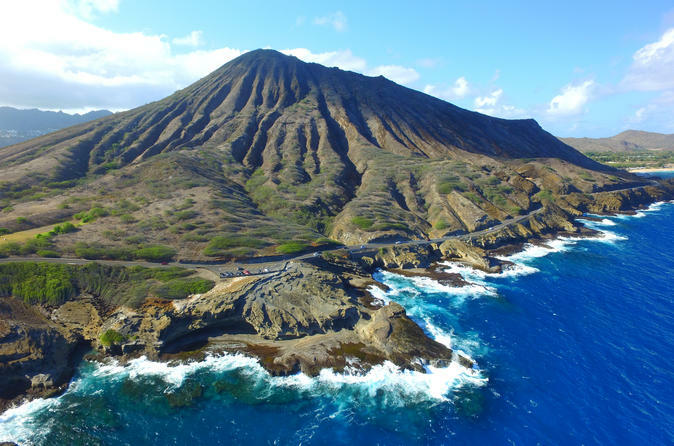 We continue onwards a series of unforgettable Oahu attractions: Makapu’u Beach Lookout, Halona Blow Hole Lookout, Sandy Beach, and Lana’i Lookout where you’ll capture the stunning East Oahu sea cliffs and be left breathless from the unique beauty of it all. For our final stop for the day will at Hanauma Bay, a protected marine life conservation area formed in 1967. Staring out at this 32,000-year-old circular-shaped late stage volcanic eruption, Hanauma Bay, your first instinct will be to reach for your camera, and we say go for it!